Creative Nightscapes is a seasoned company that designs, installs, and services all low voltage lighting systems, including landscape lighting. Our company serves clients throughout the DFW area, including those with homes in Euless. Creative Nightscapes is owned by Patrick Cheatham, who founded this company in his garage in 2004. He is a graduate of the University of North Texas. When asked why he got into the lighting business, Patrick points to his love of landscape and his desire to create something beautiful for each of his customers. Since its initial launch, Creative Nightscapes has completed more than 4,300 projects in the DFW area. In every project, our company strives to not only meet the client’s needs, but also to make the experience enjoyable. The company offers one of the best warranties customers will find in this industry. Creative Nightscapes maintains an in-house team of skilled designers and installation crews. The company maintains all of its own systems and does not hire out any work to subcontractors. Kichler, a top outdoor lighting brand, has named Creative Nightscapes Landscape Lighting Contractor of the Year for four out of the past six years. Creative Nightscapes is also a member of the Better Business Bureau and the Association of Outdoor Lighting Professionals. 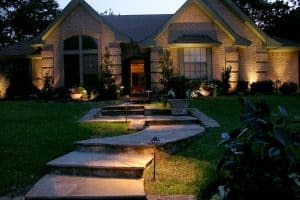 Creative Nightscapes offers landscape lighting design and installation services to Euless homeowners who want to add beauty to the exterior of their home while also enhancing the property’s safety. We provide all types of landscape lighting, including floodlights, downlights, well lights, bullet lights, wash lights, and garden lights. Whatever your vision may be, we’ll work closely with you to ensure that our design meets all of your specifications. Garden lighting allows you to enjoy the beauty of your garden at all hours of the day and night, even when the sun isn’t shining. 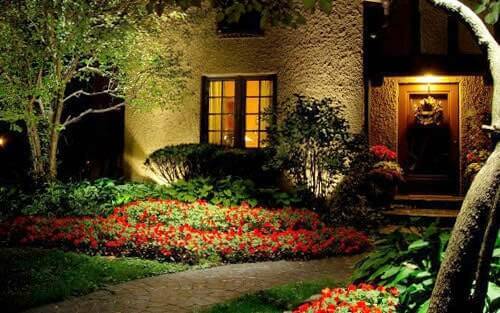 Whether you want to illuminate the entire area or simply draw attention to some of the garden’s best features, Creative Nightscapes will develop a design plan that meets your needs. A well-lit pool deck is not only visually appealing, but it is also important for safety reasons. At Creative Nightscapes, we know how to design a poolside lighting plan that will enhance the beauty of the space while also ensuring that the area is receiving plenty of light at all times. Patio lighting allows you to continue enjoying your outdoor entertainment space even after the sun goes down. Creative Nightscapes can install virtually any type of patio lighting, from ground lights that highlight certain areas of the patio, to overhead lights that provide blanket illumination. Outdoor security lighting is essential for keeping your Euless home safe. Our company is happy to help you design a security lighting plan that illuminates all vulnerable areas of your home and wards off intruders. 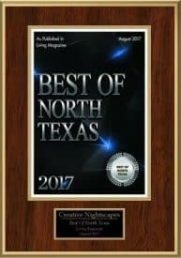 Creative Nightscapes serves Euless and cities in the surrounding area, including Grapevine, Irving, North Richland Hills, and Arlington. To learn more about services available from this LED landscape lighting company, please contact Creative Nightscapes today. Jerry was GREAT. Came out in a pouring rain storm to look at our property. Gave us great ideas to fit in our budget. Our community entrance now looks so elegant. A real show stopper!! Installed Kichler LED lighting at the entrance for Little Bear community. Placed up lights to accent tree canopies and illuminate sign. Mounted down lights in trees to create moonlighting and illuminate walkway, landscape beds, and the street on either side of the center median. Performed maintenance for a residential client in Oakland Estates; cleaned and tested and Vista LED fixtures; replaced one fixture due to ants.